Colfax Avenue: Lighthouse Writers' First Annual Book Fair! Denver Mayor Michael B. Hancock proclaimed June 2012 "Community Literary Arts Month" in honor of the 7th Annual Lighthouse Lit Fest AND the first Community Book Fair. Pretty cool, yes? You are also invited to join Lighthouse Writers Workshop for the opening of the book fair on June 15th, at 8:30 AM. Don’t miss out on this special “Grande Opening”, as there will be coffee and donuts, as well as a visit from Cary Kennedy, Deputy Mayor, city and county of Denver. 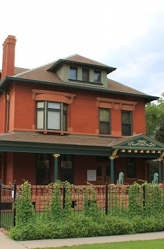 Lighthouse is located in a beautiful old mansion at 1551 Race, almost on the corner of Race and Colfax. If you need more info, go to lighthousewriters.org. ColfaxAvenue.com contributing writer Phyllis Barber will be reading at the Lighthouse Literary Festival on Saturday, June 16 with a talk on "So You Want to Write Your Life's Story? "at 10:00 AM.